The original F-Zero on the Super Nintendo really blew gamers away with its flagrant use of mode 7, crisp graphics, inspired music and tough difficulty curve. It was really the first of its kind spawning many imitators such as Wipeout. 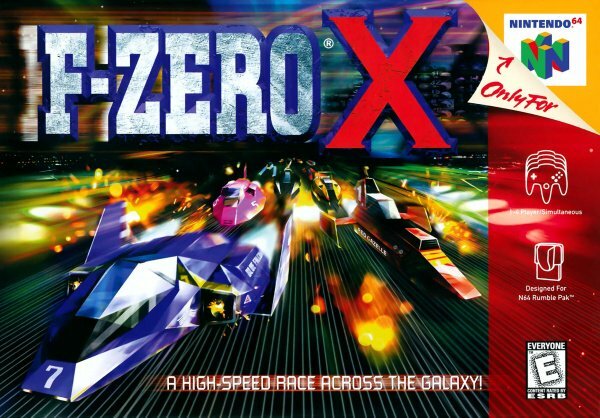 Nintendo must have known the expectations were high for the N64 sequel and pulled out all the stops in creating a game worthy of its predecessor in F-Zero X. There are no added complications before the racing action begins. The option is given to choose a craft and tweak the ratio between acceleration and speed then you are off racing! The action is fast and furious with opponent crafts trying to muscle their way to the front of the pack ahead of you. The key to success is making sure you hit the speed boost strips at every given opportunity; no rewards are given for cautious driving. The tracks are varied and challenging and all have their own unmistakable charm. The music is really well produced and complements the intense gameplay. The Mute City soundtrack is simply outstanding. A slight criticism is that the crafts and tracks all look a bit bland but the framerate and action more than makes up for the slightly less than average graphics. If an opponent is really getting on your nerves you can try using the right shoulder button to do a spin attack and sap your foe's energy or even knock them off the track into oblivion. Its 'dog eat dog' in the world of F-Zero and you have to do what you can to stay on top. In addition to the main game mode there is a practice mode, time attack, VS battle and death race. The death race is good fun as you have to take out the other racers by any means possible (the Black Bull craft is highly recommended!). These features are what you would expect from a game like this and extend the games lifespan considerably. 4 players can take part in the VS battle which is a hoot so its well worth investing in some more GameCube or classic controllers. There are several cups of increasing difficulty to compete in and when all those are beaten you can try out the random track generator for kicks. Its a shame at present that there is no solution in place to add a rumble function to the classic controller. This really adds to the game on its native N64 hardware, let's hope Nintendo come up with a solution before long, the clips on the underneath of the classic controller have to be intended for something. If you are in any way a fan of the racing genre this game cannot be recommended any more highly. Its one of the finest non-Mario games that Nintendo have ever made and deserves your attention. Dare we say it? This is the best game in the F-Zero series to date! Best racer ever. None even come close. Love it. F-Zero X is a game you simply must have in your collection, yet to my mind Mario Kart 64 has usurped it for the mantle of Best N64 Racer. It's very, very close though. This and the original F-Zero are without doubt 2 of my favorite racers ever. F-Zero GX has really corny cutscenes in story mode, but the graphics are stunning and the racing design is pretty awesome... just like F-Zero X.
sorry...but does F-zero X virtual console version have a random track generator? Or is that the expansion kit version? I bought the game for the N64 yesterday. I can't agree with the game more. This is THE best racer I've played. LOVE IT! Awesome! Another cool racing game I might look forward too! I hadn't got any F-zero games, but I have played Captain Falcon in Smash Bros. Brawl and the F-Zero game in Nintendo Land.